Gin Mare has long been the reference point for a gin that’s pushed the boundary of what a gin could taste like, with rosemary, thyme, olive, and basil included in the botanical line up. It’s savoury and unusual, balanced and complex. It’s also a Spanish Gin made in Spain, something that in due time will help it to establish itself firmly in one of the world’s biggest Gin markets. Made in the small Spanish fishing town of Vilanova, just outside the city of Barcelona, Gin Mare epitomises the Mediterranean spirit. The pot still used to create Gin Mare is housed in a chapel in a property that was once a monk’s retreat (cue Holy “Spirit” puns…). Purchased in the 1950’s by the Giro Ribot family to house it’s growing business, it manages to combine utility with a characterful location; space to distil, yet adorned with a fresco. Who said anything about compromising? Having dealt in wine and spirit deals since 1835, the Ribot family’s first foray into Gin began in the 1940’s when Manuel Giro Sr launched GIN MG, now one of Spain’s biggest selling gins. With this juggernaut firmly established, grandsons Mark and Manuel Jr wanted to assert their own ideas and create a new type of gin, inspired by the Mediterranean climate and using locally sourced botanicals. In 2007, development of a new gin made in collaboration with Global Premium Brands – who were brought on board as equal partners to lend their marketing and distribution expertise -began. They started by distilling 45 botanicals independently, though deciding which to use was made all the more difficult by the Costa Dorada region’s abundance of local produce. After much debate, tasting and tinkering, perhaps even a word with the big man whilst distilling, who knows… the brothers chose arbequina olives as their local botanical. Due to the low yield of arbequina olives when juiced, up to 15kgs of olives have to be used per distillation batch. They also add citrus, cardamom and coriander along with thyme, basil, rosemary and juniper berries. The latter are grown on the family’s land and have an unusually soft skin. Interestingly, the citrus is a custom blend of sweet oranges from Seville, bitter oranges from Valencia and lemons from Lleida. The citrus fruit is macerated for an entire year in neutral spirit of around 50% ABV. Anyone with an interest in the Gin category would do well to pick up a copy of Simon Difford’s The Bartender’s Bible: Gin, which – amongst countless reviews and insight – features an in-depth piece on Gin Mare. In it, Difford highlights the sheer grind that goes into just the citrus element of the gin, explaining that each year the distillery goes through 200kg of orange peel and 80kg of lemon peel – for which 8 – 9kg of fruit must be stripped to yield just one kilogram of peel. While the citruses are macerated together for an extensive period of time, most of the other botanicals are macerated separately for around 36h and then individually distilled in a 250lt Florentine still. The distillation takes around 4.5 hours, yielding a hearts cut of approximately 105lt. Once the six different distillations have taken place, they are blended with more neutral spirit and water to create Gin Mare. All the blending and bottling takes place in the main plant, directly next to the chapel. A testament to the brothers vision of a locally inspired gin, Gin Mare does indeed taste “Mediterranean”. It smells herbaceous, with resinous juniper and thyme dominating. Olives are also apparent. To taste, more juniper with a burst of basil, rosemaryand thyme emerge as well as coriander. 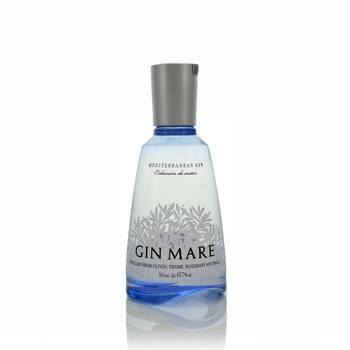 The combination feels savoury and different to other gins on the shelf, marking Gin Mare as both authentic and original. It can be considered as being part of a very short list of “Herbal” gins, and when served with the right tonic, makes for a delightful aperitivo. A decade on from the launch and Gin Mare is widely revered by Gin fans, selling well in Europe and the US. With a new bottle shape launched in 2012, and a continued effort to talk to bartenders first and host consumer events second, the brand’s on-trade presence continues to grow, with advocacy amongst trade is re-enforced. With a savvy brand team and distillers who’ve been making spirits for generations, Gin Mare is steadily growing into one of the giants of the Gin scene.